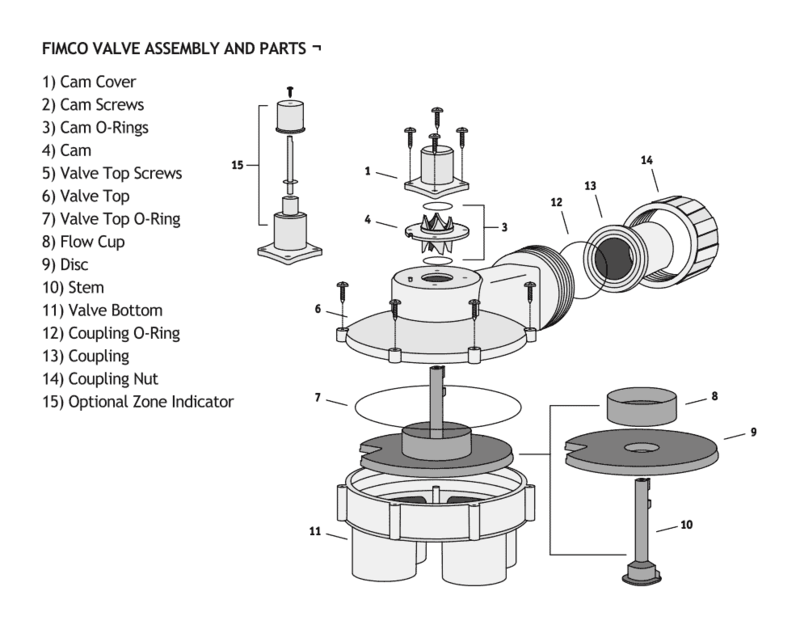 Indexing Valve Parts – FIMCO Manufacturing Inc. This is the valve bottom for the model #2006 or #9266 FIMCO hydro-indexing valve. This is the valve bottom for the model #2004 or #9264 FIMCO hydro-indexing valve. This is the valve bottom for the model #1004 or #9254 FIMCO hydro-indexing valve. This is the valve bottom for the model #1006 or #9256 FIMCO hydro-indexing valve. This is the valve bottom for the model #1008 or #9258 FIMCO hydro-indexing valve. This is the coupling for the 1000 series hydro-indexing valve. This is the Fimco 2 zone cam. This cam will enable two of the four outlets on a four or six outlet Fimco indexing valve. The three-zone black cam is made for a four-outlet indexing valve and will enable three of the outlets. This is the Fimco three-zone white cam which is made for a six-outlet valve and will enable three of the six outlets. This is the Fimco four-zone black cam and is made for a four-outlet indexing valve. This cam will enable all four outlets. This is the Fimco four-zone white cam which is made for a six-outlet valve and will enable four of the six outlets. This is the Fimco five-zone cam and is made for a six-outlet indexing valve. This cam will enable five of the six outlets.